If you pay any attention to what’s on the road or in parking lots, you quickly realize the trendy subcompact-luxury-crossover category is one incredibly popular segment. So attractive in fact, you wonder why all auto manufacturers don’t rush to offer their own delectable model to consider. I wondered that same thing waiting for Cadillac to throw a smaller model into the Crossover ring. Yes, the XT5 is their best-selling vehicle, but what about a more diminutive, less expensive option? And if they got it right, you know it would immediately be a sales hit when the model was finally unveiled. Well, wait no longer folks. The 2019 Cadillac XT4 is a most worthy candidate to drive headlong into the overflowing segment. It’s got the eye candy (if you take heed to a recommendation), luxury appointments, tech toys, ride and storage for anyone desiring the newest upscale domestic choice. Sales are already brisk. Let us count the numerous reasons why. The XT4 is essentially a successful shrinking of its sales-leading XT5 sibling. The tester’s Stellar Black Metallic paint shimmers under the sun—seriously, Cadillac has some mouthwatering pigment to choose. The signature vertical bladed LED headlights are terrific as is the Sport version’s ultra-cool blacked out grille. A tidy rear includes additional bright LED taillights and lovely dual chrome exhausts. Accents and detailing are tasteful down to the illuminating door handles. I’d recommend choosing the optional 20” rims ($1,100) to pleasingly complete the exterior as the standard 18” versions lessen the overall appearance (at least to me). But beauty is somewhat balanced by driver ride preference, so check out both choices. Anyway, my neighbors thought the overall appearance was exceptionally attractive. A peppy four-cylinder turbocharged, 237 horsepower/258-lb.ft of torque engine is quick enough (0-60 in 7.8 seconds) for most buyers in this segment. In fact, I rarely threw it in my default Sport Mode with the enhanced steering and higher-rev shifts. A new 9-speed transmission is exceptionally smooth. However, look hard at the All-Wheel-Drive option ($2,500) for the added safety and to remove the front steer torque when flooring it. Even the typically annoying Auto-Stop feature is a welcome improvement, as you never feel the stop-start in traffic—and it can even learn your driving patterns. Excellent electronic-assisted braking is reassuring. The Sport model’s thick leather-wrapped (and heated) steering wheel feels just right, and the paddle shifters are quite responsive. Gas mileage is decent for a twin-turbo 4-banger as I observed 26.2 mpg overall and 30 mpg on the highway (rated 24/30). I continue to adore the plunger design requiring no gas cap. The Sedona/Jet Black leather interior provides a nice premium feel with tasteful contrasting hand-stitching and trim bits of wood, carbon fiber and aluminum. Fit and finish are excellent. The dash instrumentation panel is well laid out and bright. 8-way power (driver) and 6-way (passenger) heated and ventilated front seats are comfortable, supportive and will even massage your cares away. An optional double-panoramic Ultra-View roof gives the cabin a beautiful airy feel. Driver visibility is good for this segment. The heated outside mirrors are a nice perk. The center console houses an improved touchscreen-capable CUE infotainment with very few bothersome buttons, but the only volume adjuster is on the steering wheel. The tester included Backup Camera, Bi-climate control, Remote Start, and IntelliBeam adaptive Auto High Beam headlights illuminate even the darkest roads. Safety measures include Ample Blind Spot warnings, optional multiple camera views, and a handy full-color exceptionally clear Head-Up display complete with speed limit signs in the windshield to keep those peepers on the road. All vehicles should include the feature. Back seat room is exceptional in this class and the 60/40 split rear seats fold flat for more cargo capability. Trunk space is good (22.5 cu.ft. behind the rear seats and 48.9 with them folded) and includes a welcome handsfree and adjustable height power trunk lid. A full golf bag including driver fits horizontally in the trunk. There’s no shortage of worthwhile technology. Four USB ports and built 4G/LTE Wi-Fi service via an OnStar subscription. to entertain the passengers. The XT4 possesses the terrific Apple CarPlay/Android Auto syncing up your smart phone to display your home screen apps—but you’ll need a charging cord to do so. There’s a handy wireless phone charging slot underneath the ample center console lid to house your phone. Genius! 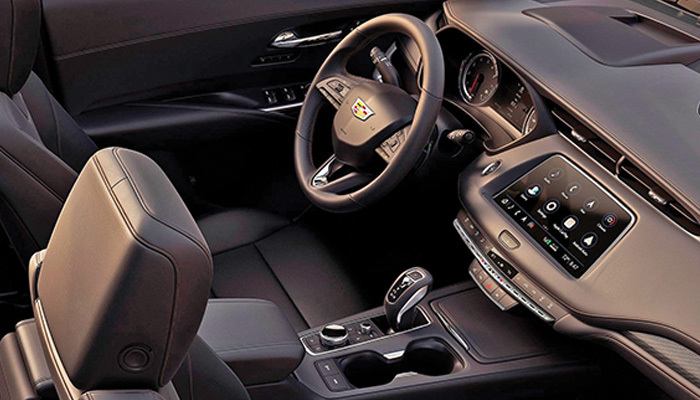 The standard 8-speaker sound System is excellent with four programmable distinct cabin sound settings. Its crystal clear as is the Bluetooth streaming. You can even have your Amazon Prime packages delivered to your XT4 as the delivery driver can unlock the car using his or her own Amazon Key app and deposit the contents into your crossover if receiving packages are problematic at work or home. While there could be some security kinks to work out, it’s an intriguing option by GM to ramp up and separate from the competing brands’ premium services. 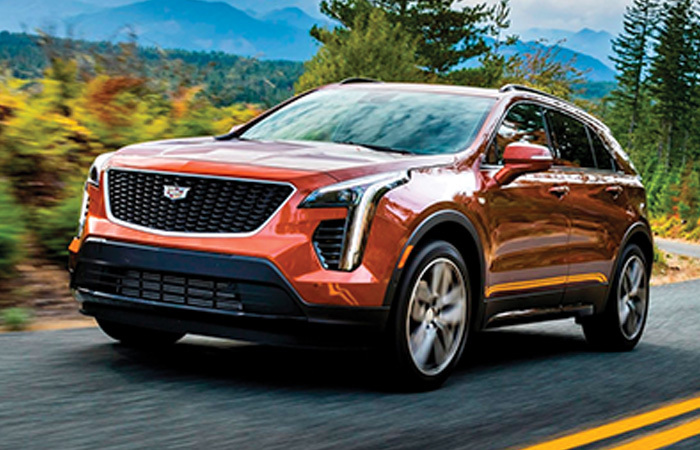 The 2019 Cadillac XT4 FWD Sport compact luxury crossover is an excellent offering for those desiring a great package of eye-candy, comfort and a plethora of technology (including Cadillac’s complimentary maintenance 4 years/50,000 miles). With a starting price of $39,250 (optioned up to $49,435), the XT4 is still less than its all-check optioned import counterparts. Thus, the XT4 is a terrific package when in the market for your next compact luxury domestic crossover. It’s definitely worth the wait. Gas mileage: 24/30. Observed 24.2 overall. Warranty and Free Maintenance: 48 mo/50,000 miles warranty; 4/50k maintenance.